iPad Air Plus: will this spell the end of the Macbook Air? Over the last few days we”ve seen leaked specifications for a proposed iPad Air Plus, a 12.2″ big mother to join the established members of Apple”s tablet family. There is a high chance that this may even be called the iPad Plus but whatever the name is, we”re confident that this will be hitting the shelves in the near future. What features will the iPad Air Plus have? When can we expect the iPad Air Plus to hit shelves? 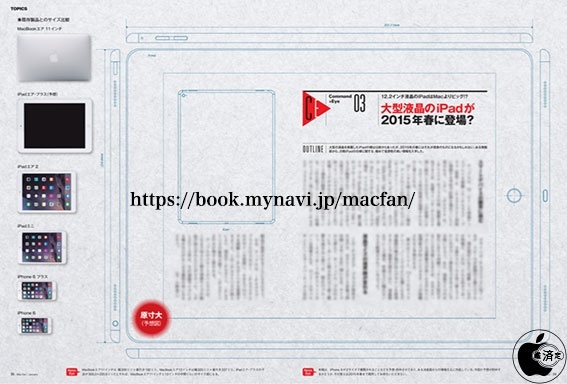 The latest leaked specifications, courtesy of a report from MacFan, points the finger towards a device size of 30x22cm ( 305.31 x 220.8 x 7 mm to be exact). Recently Samsung put out the 12.2-inch Samsung Galaxy Note which we feel hints at a higher probability of these leaked specifications becoming reality. The size of Apple”s device would be big enough to house a 12.2-inch display and the iconic home button with a fingerprint scanner. We really are at the early stages of the proposed specifications for this product but from this report we can expect the “now-common” feature of a fingerprint scanner to be included, along with the traditional Apple home button centred at the bottom of the portrait angle of the device. Screen resolution is yet to be confirmed but we believe this to to see a higher resolution display than what is currently offered in the current iPad Air and the Samsung Galaxy Note. One of the more interesting developments from this latest leaks is mobile casino the configuration of the speakers. We”ve seen a litany of Android tablets with forward facing speakers, all in the name of providing as close to a cinema experience as you can get on the iPad. If these last leaks are to be true, the new iPad would see a staggering 4 speakers located before the upper and lower corners on the shortest sides. The sound quality out of the latest generation iPad Air has been a beautiful balance of sharp, clear and vibrant. To think that these speakers could now be a set of four, makes us think Apple is gearing up for a strong media tablet. If we have seen anything from the tablet market recently, it”s that consumers are rather unlikely to upgrade unless they really have to. On the flip side of this, consumers seem to be hanging out for that viable tablet option to replace their laptop. Could the processor in this finally give apple users the grunt they need to replace their Macbook Air altogether? The iPad Air Plus is likely to be powered by a next-generation A9 processor, if you pull apart the current model iPad Air you”ll find a more than capable (but still not power-user quality) A8X processor. Until we have more specifications, it”s hard to tell just what this new processor possesses but we”d love to see a processor at least comparable to the Microsoft Surface Pro 3 (or even 4 by the time the iPad Air Plus is released) in order to make it a viable option to be replace a laptop all together. We still have a lot more information to find out but we”re expecting a ballpark release date of June-July of 2015 (courtesy of the International Business Times). Until then we will have our ears to the ground listening for any news on the processor, resolution, design and software features of what is one of the more exciting tablet products in recent years.